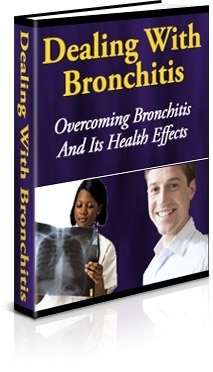 In this eBook, we’ll discuss what bronchitis is, what it can do to your health and how to keep it out of your life as much as possible. By learning this now you can protect yourself in the long term from what bronchitis can do to you. Bronchitis And Its Relationship With Sinusitis. The Difference Between Chronic And Acute Bronchitis. Distinguishing Whether Or Not You Are At Risk. Deciding On When You Should Seek Medical Attention. How A Doctor Goes About Diagnosing You. Different Treatment Options That Your Doctor May Give You. The Dangers Of Not Getting Treated. How Often Does Bronchitis “Strike”. An Explanation Of Chronic Bronchitis And Its Relation To Emphysema. What Will Happen To You When You Have Chronic Bronchitis. Chronic Bronchitis And How Fast It Will Overwhelm You. Surviving COPD And Its Effects On Your Life. The Job Of Medications You May Take While Coping With This Ailment. What Is Included In Pulmonary Rehabilitation. The Necessary Lifestyle Changes That You May Have To Do. Smoking And Its Effect On Bronchitis. Different Therapies You Might Consider Doing When Having Bronchitis. How Dieting WILL Help You And Your Fight To Overcome Bronchitis.